When five billion reviews just won't cut it, we provide the five billionth and first. And don't worry, we promise not to use the word "Celda". ...Oops. That kid with the sword sets out to save his sis and eventually battle a larger evil in this almost criminally charming new Zelda adventure. Quite a number of Zelda games have been released in the past couple years, but just like Mario, none of it matters until the "purebred" series sees continuation. That said, despite the onslaught of Masks and Oracles, the wait for this latest Zelda has still been excrutiating. Surrounded by controversy and staring down an uncertain future, Zelda: The Wind Waker has come out a winner. Gee, what a shock. If you read all the interviews before Wind Waker came out, then you probably learned that Nintendo finally gave up trying to chronologically explain all the Zelda games and simply said that each Link in each game is more or less a different Link that rises up to defeat Ganon. But that explaination wasn’t just fluff to get Matt Cassamasina off their backs; Wind Waker is the first Zelda game to acknowledge that fact and actually meant to follow the last "main" game, Ocarina of Time. It’s all explained in the neat intro: 100 years after Ocarina, the legend of the Hero of Time (old Link) is revered and passed on through generations. Some bad things happen (gotta avoid those spoilers) and the land of Hyrule is submerged in a Kevin Costner wonderland. We then come to a little place called Outset Island, where a young lad named Link is woken by his sister, Aryll. Soon, a series of events involving a band of pirates ends up with Aryll being kidnapped and Link, determined as he is, sets out to save her. After another series of events, he’s eventually joined by a talking boat called the King of Red Lions, and explores the neighboring islands of the Hyrule seas. And as you might guess, the story picks up greatly just after the middle of the game as Link discovers his true destiny. Since there’s no escaping the graphics, let’s get all of that out of the way first. As you know, Link’s brief stint as a boyish elf-stud has ended for now, and this new Link is a permanently preteen adventurer with a fishbowl head and eyes that pierce the darkness. 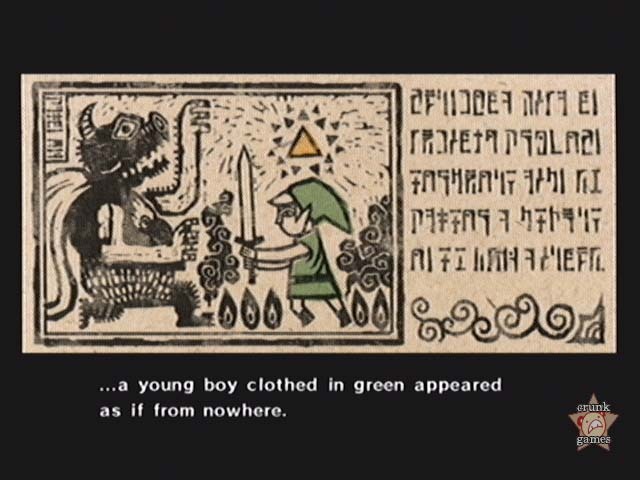 In fact, a heroic prepubescent chap is pretty much what Link was like in the first Zelda game. And the third. And the Game Boy ones. And so on. Really, what was the big deal? The visual style seamlessly integrates the spirits of both the original games and the later N64 ones with hints of stylistic touches more common to a Disney film. It’s just art, you don’t need to be afraid of art. Now, we know that when someone watches someone else playing a game, they fixate more on the graphics than the act of truly playing it. 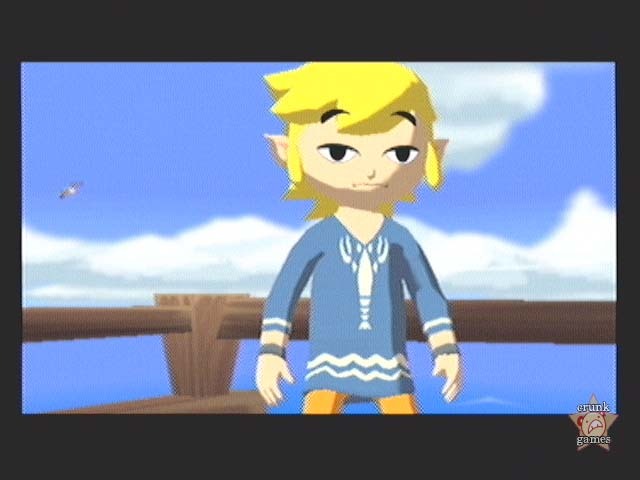 With Wind Waker it’s the same, it’s just that it’s been blown way out of proportion by cynical members of society. Once you play it, you have a good chance of paying less attention to what it looks like and more on what you need to do next to beat it. And for gosh sakes, if anyone resists Link’s numerous hilarious expressions that he makes throughout the game, they really ought to be slapped. Speaking of actually playing it, you’ll feel right at home with the control scheme, doubly so if you’ve plugged away at the Ocarina bonus disc. The now-standard targeting system is still in place, with some added, less random moves for Link to pull off, including the particularly artful parry attacks. There’s nothing quite so satisfying as having Link roll behind an enemy and slash its backside gracefully. However, it’s not the most usable control ever: if one thing knocks it down, it’s the practice of actually moving Link. Like in the N64 games, it’s hard to get him exactly where you want if you’re trying to open a chest or read a sign or some such. Swimming is pretty much the same, having to take every turn at a wide angle just to climb a ladder or lift yourself onto shore. But thanks to the trusty boat you won’t have to do that too much. Link also has a pile of items to use, although they’re nothing that you haven’t seen or know how to use before. There’s even bait for animals and enemies, which hasn’t been seen since 1986! 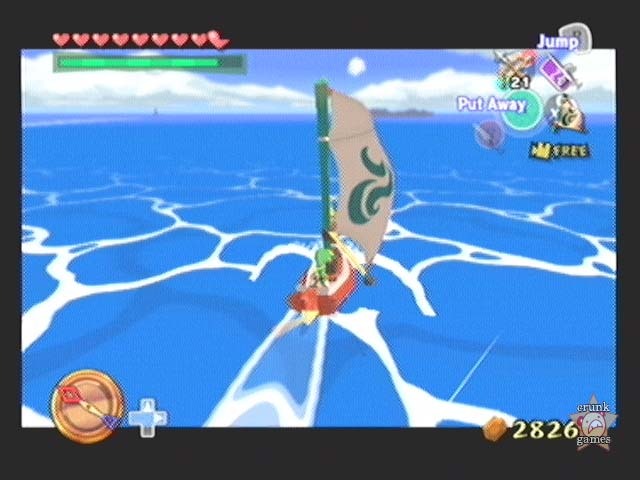 Of course there’s also the Wind Waker itself, a baton that does just as much as the ol’ Ocarina of Time did. Much in the same way, you use the camera control to play it, using simple patterns to execute the right song. Songs that change wind direction and to warp around the sea map will aid you very well as you make progress. Then there’s the dungeons, arguably the most integral part of the series. Strangely, the usual set of eight mazes to overcome has now been pared down to five, resulting in a much shorter Zelda game than what we’re used to. Joining this shortened length is an equally trimmed difficulty. Granted, the bosses are predictable and the usual goons are easy as ever, but everything is so sparse that you rarely get ambushed or lose sight of a guy behind you. The game is not going to make you any more blade-happy, but true to the formula, the greatest challenge in Wind Waker comes from the exploring. When you’re getting wrapped up in side quests, hunting down Pieces of Heart and even lazily sailing along, you’ll have already wasted enough time to surpass the main quest’s 20-some-hour length. 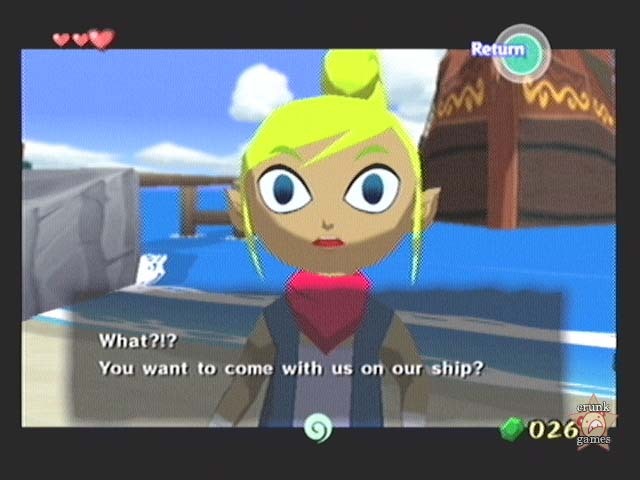 For those of you who dismiss Nintendo’s gimmicky attempts to link the Game Boy Advance and the GameCube, I have to tell you, if you’re obsessed enough with Wind Waker you’re going to want to get that ten-dollar cable (and/or 70-dollar system). The GBA makes the whole experience that much more worthwhile, and is easily the best use yet of the portable system. Your chance to use it comes early on, when you stumble upon a jail cell and free the unsettling Tingle, the fairy fetishist from Majora’s Mask. In return he gives you the Tingle Tuner, a GBA-like device that allows you to call him whenever to request assistance. Although intended for a second player so as not to screw up your concentration, friendless schmoes can also use the Tuner just as effectively. When everything’s connected, the first thing you’ll see on the GBA is an automap, much like the one already in the main game, just larger. In a town the map isn’t so useful, but when taking to the seas it can help with pathfinding greatly. On the TV you’ll see a Tingle icon beneath Link’s feet, which can be moved around freely with the GBA and seen on both screens. By doing some exploring with the Tuner, you can find hidden rupees, find out more information about characters (or Tingle’s own weird obsessions), and find the ever-valuable Tingle Statues in dungeons. 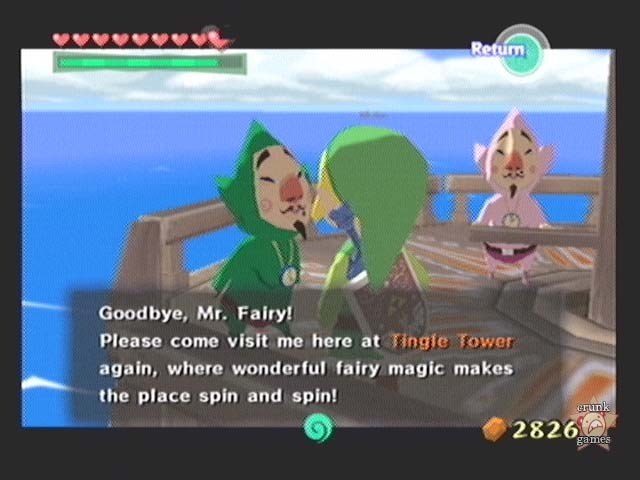 You can even trigger mini-quests like walking over to certain spots on an island at Tingle’s request to get a special bonus (like the humorous Hand-me-Down Tingle Tuner). More importantly, Tingle has a stock of restorative and offensive items to aid Link in a particularly tough spot. Have him toss you a potion or drop some bombs (word) or just tell you what time it is in the game. Money-sapping gimmicks aside, anything that can help your game more gets instant cred. Lastly, aside from Link’s grating screams whenever he falls down too far, the rest of Wind Waker is pretty pleasant on the ears. Although the lack of the full classic Zelda theme (except in the intro cinema) is a travestry against humanity and should not go unpunished, the music is another great accomplishment from Koji Kondo and the rest of the sound staff. The usual rule applies: if the first area don’t sound good, you’ve done it wrong. That said, your first jaunts on Outset Island set the stage for the rest of a generally upbeat soundtrack that compliments the color-rich visual style very well. Ocarina of Time Master Quest, a.k.a. Ura Zelda is the toughened-up remix of the N64’s first Zelda, once planned as an add-on disk for the 64DD. With major renovations in the temples, Master Quest is worthy of its name. The game is included on the Wind Waker pre-order bonus disc along with the original Ocarina of Time, but you already know that what with everyone on the continent preordering Wind Waker.